Venice is one of the most architecturally rich, varied, and exceptionally well-preserved cities in the world, but given the high number of tourists visiting the city every day, the restaurants in Venice can really be hit-or-miss. Nevertheless, the best restaurants in Venice offer up some of the best food in Italy. To help you have the best culinary experience in Venice, we have included a few of our favorite Venetian foods, local wines from the Veneto, and of course, a list of our favorite restaurants. Seafood is definitely the way to go in Venice. We have pulled out some of our favorite local foods that are typically Venetian. For more tips on the local cuisine, check out our Italian food guide. Seppie: cuttlefish, which is basically squid, but a little larger, and with darker ink. 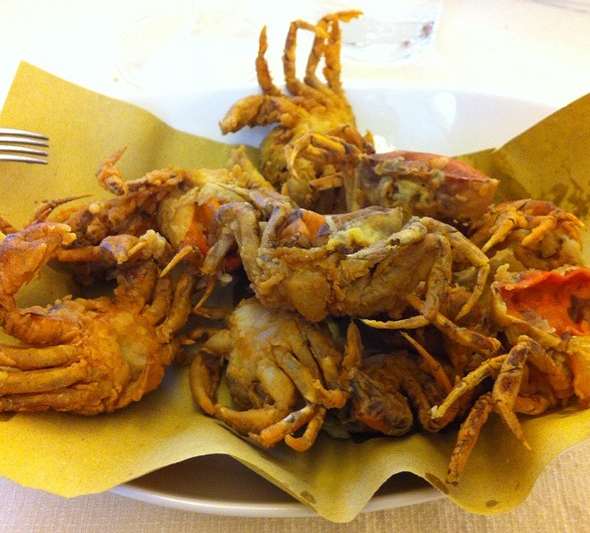 Moeche: tiny soft shell crabs, usually fried. Razza: ray/skate – although we enjoy this dish (pan sautéed) in the States, sadly, we never found the dish to be appealing in Venezia. The Veneto produces some excellent wines. However, while we would certainly recommend going with the Veneto’s signature sparker, prosecco (particularly from the Prosecco di Conegliano-Valdobbiadene DOC), the region’s vast and impressive red wine repertoire is not going to work with Venice’s seafood-based cuisine. Since the Veneto’s whites are generally disappointing (based on the trebbiano and garganega varieties), we would suggest looking to the nearby Friuli region. Friuli’s whites are probably the best in Italy. Look for the wines based on the friulano, sauvignon, ribolla gialla grape varieties. Keep in mind that the wines from the Collio and Collio Orientali DOC zones set the standard for the region. If you are traveling to Italy, consider downloading our wine guide app for the iPhone, iPad or iTouch. You will learn all you need to know about Italian wines and be able to order with confidence in a restaurant or a lcoal wine shop. In addition, the app never requires an internet connection so you don’t risk using an expensive international data plan. Antiche Carampane. Rio Terra Rampani (San Polo) 041/524-0165. Great seafood, focused on home-style preparation with high quality ingredients. Excellent, slightly out of the way place for dinner, with a solid friendly staff and a classy, casual atmosphere. Best overall. Antiche Carampane is a great experience, one of our favorite in Italy. Closed Sunday and Monday. Alle Testiere. 5801 Calle del Mondo Novo (Castello). tel 041/522 7220. Excellent seafood restaurant. Good food, cool vibe, and the best wine list. The most elegant dining of all of the restaurants on this list. The only negative is that the seafood can be a bit over-prepared, meaning that the sauces can sometimes overwhelm the more delicate flavors of the seafood. Only 9 tables, so you have to reserve. 2 seatings: 7:30 and 9:30. Closed Sunday and Monday. Al Covo. Campiello della Pescheria (Castello). 041/522 3812. Delicious, very high quality Venetian seafood. Right up there with Antiche Carampane and Alle Testiere, however, we would argue that the energy level and feel are superior at the other two. Further, prices here are at least 10-20% higher than the other restaurants. However, this is the best option for dining on a Sunday or Monday, when the other top two are closed (Al Covo is closed Tuesday and Wednesday). La Corte Sconta. (Calle del Prestin, Castello, 3886. Near the Arsenale. tel. 041-522-7024; closed Sunday and Monday; also from 7 January to 7 February, and from 15 July to 15 August. ). An old-school seafood-oriented trattoria, that has a slightly simpler décor than the others on the list (tables topped with butcher paper and red napkins); the seafood quality is like Antiche Carampane and Alle Testiere, but it is more casual and offers simpler preparations. They base their daily menu on whatever the Chioggia fish market has to offer. We do find the service rushed, a bit pushy and prices (food and wine) higher than its peers. Although still a good dining experience, the food is the weakest of the top three. Since the founding of the Venetian Republic in 697, it fought to preserve its status as an independent trading center bridging East and West. Explore St. Mark’s Basilica, both a symbol of and justification for the city’s greatness. The qanat (pronounced ka-naht) is an Arab-designed underground canal/irrigation system that directs water from a high-elevation aquifer water source to a town or agricultural area along a perfectly-calculated and very slight downward grade (see illustration). Invented by the Persians in 1000 BCE and functioning as a “below-ground aqueduct,” it is ideally suited to warm, dry climates, such as Sicily. A vestige of Sicily’s Islamic period, Palermo’s qanats make for a fascinating visit. SottoSopra is a local nonprofit that guides small groups into a still-functioning qanat. You can contact them online or by telephone (+39 091/580433). If you don’t speak Italian, it might be best to have your hotel call and set up the appointment for you and to get explicit directions. It’s important to be aware that the water is cool and you get into it up to your chest, so come prepared with clothing that you can get wet (they will provide boots). How a qanat delivers water from a high-elevation water source to a lower irrigation area. Osteria Paradiso. Via Serradifalco, 23 (close to the Zisa). Only open for lunch, this is a very good place for super-fresh seafood and pastas. The owner speaks only Italian (and there are no written menus) but you can just ask them to bring out any of the pastas mentioned and you will be very happy. Closed Sundays. Antica Gelateria Lucchese. Located on the south side of Piazza S. Domenico, 11, this is one of our favorite gelaterie in Palermo. Go with a granita here — the mandorla (almond) is the most traditional and delicious. Locals order their gelato in a brioche. Mi Manda Picone. Via Paternostro 69 at Piazza San Francesco d’Assisi. Excellent wine bar that has a very extensive list of Sicilian wines by the glass. The bar also has a restaurant attached, so you can get food, if you wish. While researching our Regional Guide to the Foods of Italy, we traveled throughout Italy visiting local markets and eating in thousands of restaurants seeking out the cucina tipica (typical foods) of each region in Italy. We found that the best restaurants in Italy are those that remain true to the local cuisine. The country’s Slow Food movement has championed this perspective and developed a great resource for travelers looking to eat local. Get the book or app. 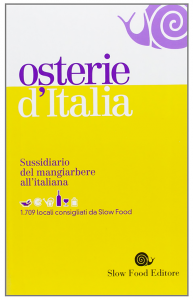 We recommend purchasing a Slow Food book, called “Osterie d’Italia.” It really helps with restaurant selection and does a great job at highlighting the most traditional dishes. Buy the book on Amazon before you go, or if you want to travel light, purchase the app on iTunes. Italian only. The book is only written in Italian (a limited English version is available in some bookstores in Milan, Rome and Florence). However, even if you’re not fluent in Italian, you can easily discern the restaurant names and the recommended dishes, which are highlighted in bold typeface. Slow Food is a global, grassroots organization linking the pleasure of good food with a commitment to local communities and the environment. Founded in 1989, this global, grassroots organization strives to prevent disappearance of local food cultures and traditions, counteract the rise of fast life and combat people’s dwindling interest in the food they eat, where it comes from and how our food choices affect the world around us. Since its beginnings, Slow Food has grown into a global movement involving millions of people, in over 160 countries. The organization has published seventeen editions of the Osterie d’Italia guide, which promotes Italian regional cooking and has contributed to the revival of eating places that particularly reflect local flavor and character: restaurants, osterias, trattorias, and wine shops–all of which serve foods known for their quality, value, and faithfulness to tradition. You will see Slow Food stickers on the doors of all of the restaurants that meet its criteria: sourcing food from local, high-quality artisanal producers; having a menu that is true to the local cuisine and achieves successful prepared results; and delivering good value for money. Due to its compelling colors, human-sized proportions, and central location in the downtown district, the Martorana will likely be the church that you return to a number of times during your stay in Palermo. It is our favorite stop on our tour of Palermo’s Norman churches. Fig. 1. Dome mosaics, Martorana. Highlights added. Photo by: ChrisO. The focal point of the Martorana’s decoration is the dome (see Fig. 1), consistent with Byzantine tradition and the church’s original central plan layout. The dome’s decorative scheme is a simplified, more intimate version of that of the nearby Palatine Chapel. A seated Christ Pantocrator — head backed by an inscribed cross halo and flanked by the letters ΙCΧC, a Greek Christogram for “Jesus Christ” — occupies the center of the dome. A white ring around the Pantocrator image holds an inscription (see Fig. 2) that quotes, in Greek, from John 8:12: “I am the light of the world. Whoever follows me will never walk in darkness, but will have the light of life.”. It matches the inscription that appears in the open books held by the apse Pantocrators at Cefalù Cathedral, the Palatine Chapel, and Monreale Cathedral. Note, however, that the Latin translation held by the apse Pantocrators has been omitted. Four winged archangels — Michael, Gabriel, Raphael, and Uriel — symbolizing Christ’s divine incarnation in heaven, comprise the balance of the dome’s decoration. They are depicted bent over, with long torsos and extremely short legs. While the distorted proportions might reflect the mosaicists’ desire to symbolically convey their extreme deference to the Pantocrator, it might also be attributable to a poor adaptation from an earlier prototype in which the angels were kneeling rather than standing. Interestingly, around the edge of the base of the dome (at the feet of the archangels, and virtually invisible from the floor of the church) is a wooden frieze with an inscription of a Byzantine hymn in Arabic translation. Eight prophets — each standing with a single arm raised, as if directing beholders to the Pantocrator above — are wedged between the squinches and round arched windows. The mortal counterparts of the archangels, they symbolize Christ’s human incarnation on earth. The four evangelists — Matthew (in northeastern corner), Mark (in northwestern corner), Luke (in southwestern corner), and John (in southeastern corner) — sit in the squinches. Just below the Evangelists, on the eastern side, is a depiction of the Annunciation: Gabriel hovers on the left, announcing to the Virgin Mary (seated on the right) that she will conceive and become the mother of Jesus. On the western side is the Presentation of the Child at the Temple: Mary holds the baby Jesus on the left, handing him over to Simeon, the Jewish High Priest, on the right. Fig. 2. Closeup, dome Pantocrator, Martorana. Photo by: LongIslander. Just as with the Palatine Chapel’s dome Pantocrator, Christ suggests his gentler, more forgiving nature with his controlled arm raise and closed book (see Fig. 2). This compares versus an emphasis on his role as supreme god and apocalyptic judge in apse depictions. Although the original central apse has been destroyed, it likely held an image of the Virgin Mary, consistent with earlier Byzantine prototypes. This is supported by the fact that the Martorana was dedicated to her and the side apses hold images of her parents (Joachim and Anne). Although mosaicists deviated from this traditional model in other churches, they likely adhered to it in the Martorana (and likely the original Palatine Chapel) given its pure central plan layout, wherein the dome over the crossing was still the position of greatest importance. Located in Piazza Bellini, the church is one of Palermo’s true gems. Officially, the church is open from 8am-1pm and 3:30pm-7:00pm from Monday through Saturday, and from 8:30am-9:45am and 11:45am-1pm on Sunday. However, the church is sometimes closed without warning, so try to visit early in your stay, as you may have to try a few times. Check the most up-to-date times on the Martorana official website. If you see an event going on in the church, try to poke your head in — events are one of the few times the lights will be turned on to illuminate the church’s glorious mosaic art. Having finally won the island of Sicily from entrenched Islamic forces after thirty years of battle, the Normans set upon creating a multicultural kingdom to inspire the world. While the Norman civilization has since faded from history, its brilliant churches, glittering with mosaic decoration, serve as enduring reminders of its greatness. 18th century Neapolitan Rococo architecture is best illustrated in the work of Ferdinando Sanfelice (1675-1748), who is known for his striking staircases. We especially love the Palazzo della Spagnuolo. Via dei Virgini, 19. Sanfelice’s stairway in this building is distinctive for its height, the large size of its openings onto the courtyard, and the movement of the design. This is a great example of how architecture of the Baroque keeps your eye in movement: notice in this picture how Sanfelice skillfully draws your gaze upward — the lines are sharply vertical and the flanking arches are not regular but follow the line of the staircase — giving the structure a lightness that would otherwise not exist.